Polish documentary on the life of Frédéric Chopin narrated by Ian Gillan (which we’ve covered previously) has been completed. 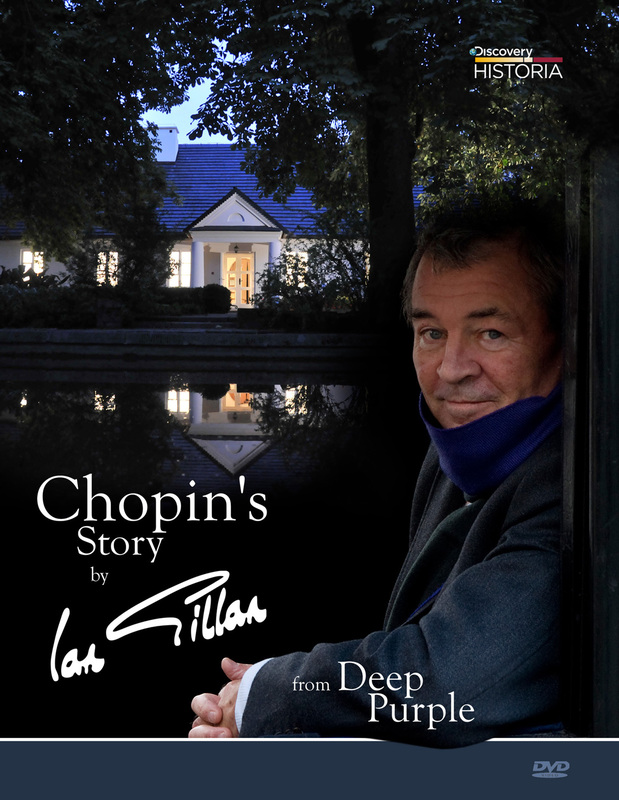 It’s got a new title — Chopin’s Story by Ian Gillan from Deep Purple — and will be aired Polish channel Discovery Historia on June 21st. The documentary was produced by TV Project and directed by Jerzy Szkamruk. So far the film has won four international awards, the most prestigious being ‘Best Documentary’ award in Florianopolis, Brazil, in 2011. A worldwide DVD release is also in the works, with release dates to be specified “in the nearest future”. The documentary itself clocks around 23 minutes, plus there’s a 10-minute bonus interview with Ian centering on his involvement in the project. One of the proposed DVD covers can be seen on the right. The movie is about the rise of extraordinary artistic genius of Frederic Chopin and documents his Polish years. Ian Gillan, the singer of rock band Deep Purple, takes you on the journey around Poland to show how his home country and the local people helped creating one of the most prominent artist in the history of music. The movie is contemporary take on how a piece of local culture morphed into beloved treasure of European heritage. For further info visit the movie’s official Facebook page. Thanks to Marcin Rybacki for the info. Posted by Nick Soveiko on Monday, June 20th, 2011, filed under News. You can follow comment on this post through the RSS 2.0 feed. You can leave a comment below, or trackback from your own site. I don’t mind Ian’s involvement in such an interesting thing. Although Ian Gillan’s connection with Chopin is rather unclear–out of the Purple family, Don Airey seems to be the more obvious choice–the snippet previously made available by THS hinted at some very good editing, wonderful photography and outstanding production values. I recall the Leonard Berstein/Maximillian Schell documentary on Beethoven some time back, shown in America on PBS. These kinds of things are of great interest to ‘classical’ music aficionados, although I’m not sure the typical headbanger is interested in the ‘Raindrop’ Prélude. Too bad. The kids today are missing out on some fine music. Yes… Will there be credits in Polish on the DVD? The film is about Poland and it was shot in Poland, too. Maybe, hopefully we under estimate many of those stereo typical looking people. Ugly sounding guitars, loud music, long hair, appalling behaviour, terrible noise without melodies(my sisters favourite complaint about heavy rock while she appearantly confused it with no rhythm-she was reasoning out of HER taste which was disco : ( , drums terribly loud, ugly screamers-Child In Time was not a phenomenal effort but just screaming. Once, in 1997, I cut my hair short, and they reacted as if I were finally growing up. The moment I talked about music(of their taste) I loved they embraced this with saying : finally you are leaving that garbage behind!!!! I sputtered : But….But….. But…… I loved this already ages ago and it does not mean I still love heavy rock. They were utterly surprised when I occasionally talked about my love for Bach. While they very clearly knew about nothing of the old heritage. An old (90 years of age)very Catholic neighbour reacted the same. When I tried to indulge into a deeper conversation about Theology(She ought to have been very able to talk about the content of her beliefs) and classical music(Was and is christian religion not intwined with a lot of Classical music?). The conclusion was she overtly appeared to be “old school and all that” but it was just a outer layer, meaning nothing. She appearantly never had felt the hunger to dig deeper. Once a year she attended a Mass and that was the musical side of things. You’re not the typical headbanger. @T -it’s Ian’s connection to Poland that is of most of the significance, it naturally lends to the Copin factor, so knowing of him they chose the right man. Otherwise there is no ‘connection’ to speak of, a rather odd choice of words there to say the least, but understood, I think. Ian is just the visual narrator, which he was surprised to find out because he thought it would be an audio commentary. There really isn’t anything more to read into it. This is a short program btw…. nothing exactly epic, but I trust it will be a good look at Poland and Chopin, just as much or more than Ian himself, as it’s not about him, obviously. We have Marcin to thank for this campaign, he is doing a fantastic job bringing the official product to the internet fan base in each stage as it comes. My hat goes off you you, my friend. This would have been great fun seeing him do this around 1983. Now he looks the distinguished gentleman , but way back ….. Doing my best. Thanks for your support, my friend. It means a helluva lot to me. You’ve nailed it with Gillan’s connection to Poland. That was the original idea – to invite somebody who doesn’t have much in common with Chopin but is somehow connected to Poland, and people living here. You mean Polish subtitles, right? Not sure. I’m going to ask Mr. Szkamruk and let you know. And thank you to the editors of THS to post the above news item on such a short notice! I’ve been looking forward to this release for a while now but…..please tell me the documentary is longer than just 23 minutes?!! Yes, it’s 23 minutes, but you get a very intense and overall satisfying experience. There’s going to be a bonus on the DVD. A 10-minute interview with Ian done after the Chopin project was recorded.